When I was thinking of what I should write about today, I realized that I've only briefly mentioned my food allergies, here, here, here and here (when I say briefly I mean less than a sentence). 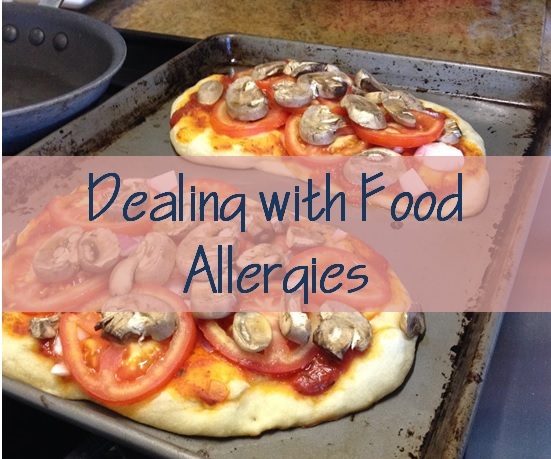 So today I give you part one of my food allergies, how I found out I had food allergies. Let's begin with the most asked question I get. No I didn't have this all my life. I found out when I was about 26, so yes I do know what everything tastes like, but over the years, I have started to forget what things taste like, like cheese, and ice cream, horrible I know! So I'll start from the beginning. When Mr. and I were dating I had no problems. I would occasionally get a stomachache after eating, but justify the reason why. I ate a donut for breakfast, I ate too much Mexican food, I'm just really full. I kept explaining away my stomach problems. I was also getting sick a lot, getting sinus infections every 6-7 weeks. It was awful! Anyway, one night we met there after a particularly hard day at work and went about our usual order of 2 mini pizza's (one of them was the Southwest Pizza, and I think a BBQ chicken one) to split, beer and of course the Pizookie. We finished, I was feeling fine and we got into our cars and followed each other home. By the time we got home (about an 8 minutes drive) I was in so much pain I could barely walk. Mr. had to practically carry me upstairs to our condo. The pain was so bad, it felt like a million knives were stabbing me and then someone was twisting the knife. It was horrible, I was in so much pain that I eventually passed out and slept the rest of the night. When I woke up feeling much better I knew I just wasn't lactose intolerant, that it had to be the cheese...little did I know. I made an appointment with an Allergist for just after the new year. I went in, she asked questions about my diet, what I ate the most of, did I eat this or that..first we took a blood test to see if anything would come up in my blood work. It turned out negative, I was disappointed, I knew something was wrong. The next step was to do the famous "scratch test". Let me tell you it's as awful as it sounds. Especially if you are allergic to everything like I am. I had over 80 scratch test performed. And by the time she was done even putting the allergens on my back, the first ones were already starting to react. But we had to wait 20 minutes to get a full reading. My mom was with me and she was staring at my back saying, wow this is amazing, you are allergic to a lot. I told her, I know, it hurts! Around the 10 minute period the nurse came and and with wide eyes, said, I think you're allergic to his, let me wipe it off to give you some relief. They were starting to bubble. 20 painful and itchy minutes later the doctor came and "read" the results. Want to know what it said? Come back next week, haha, just kidding. It said that I was allergic to EVERY tree, plant and grass in Southern California. Crazy right? It also said I was allergic to milk, soy, corn, peanuts, chicken and most nuts. I can eat cashews, but I just don't like them. I'll let all those allergies sink in for a second. Think of everything that has corn syrup in it...yep all those things gone. Doing a quick search I found this site with a list of corn products and a list of potential corn products. Did you know that food labled with anything 'ose, like dextrose, sucrose can be a corn derivative? Also carmel color, ascorbic acid, sorbitol (used in gum), citric acid...those are just to name a few others. It's everywhere. It was a hard adjustment, but I think this has gotten long enough, next time I'll go into the first few months and how I dealt with it. Let me just tell you, there was a lot of pity parties, party of one going on. Oh my goodness! That test sounds horrible :( I have always had stomach issues or coughing attacks after having milk, ice cream, etc. I have really limited my dairy and that has helped thank god! I can't imagine how you adjusted! My gosh, that is crazy. And I can't even imagine how hard of an adjustment. SO many things to double check, ooph. My list of foods is growing to match yours :( For me the nuts is the most limiting and scariest one. They are everywhere it seems. I am currently avoiding dairy since I am still breast feeding my youngest and he's allergic. He has a protein allergy called FPIES and we are actually trying corn right now. Fingers crossed he doesn't react. That scratch test is miserable... My oldest son is allergic to every tree in our area also. He was in tears by the time his test was. " read ". Big bummer.